The Jacobins were the most famous of the political clubs that fomented the French Revolution. Initially moderate, they are remembered mainly for instituting the Reign of Terror. Crane Brinton's The Jacobins was written in the 1930s, itself a decade of the violent centralization of unchecked political power. 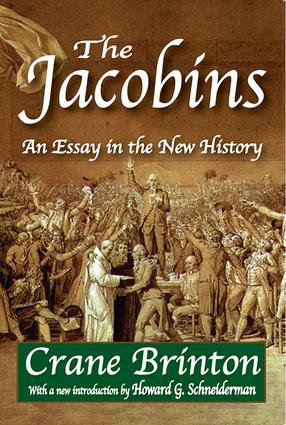 Brinton offers not an account of the actions of major figures, but an anatomy of Jacobinism, its membership, beliefs and political platform, the relations between the central Paris club and the regional groups, and how it evolved from moderation to tyranny. Brinton argues that when one considers the material facts about the Jacobins— their social environment, occupations, and wealth—one finds evidence of their prosperity to justify predicting for them quiet, uneventful, conservative, thoroughly normal lives. But when one studies the records of their proceedings, one finds them violent, cruel, and intolerant. The Jacobins present a paradox. Their political being seems inconsistent with their actual intentions. The Jacobins presented for a brief time the spectacle of men acting without apparent regard for their material interests. As the brilliant new introduction by Howard G. Schneiderman indicates, this contradiction defines the Jacobins, and perhaps most other revolutionary movements.